Edina senior captain Ben Walker is leaving the local high school hockey ranks to play in the Western Hockey League, Hornets coach Curt Giles confirmed. Walker, who informed Giles of his decision on Monday evening, is expected to sign with the Victoria Royals. Monday was the first day of high school tryouts. Playing in the WHL, where players receive financial compensation, forfeits Walker's future college hockey eligibility. Walker contributed to the Hornets' Class 2A state title run in 2010. As a junior last season he scored 18 goals and added 14 assists. 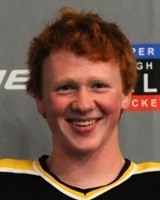 Known for his speed, the 5-foot-10, 174-pound Walker scored 14 goals and added 13 assists playing 24 games for Team Southwest of the Elite League this fall.